Alexander Dennis Limited’s Enviro500 full flat floor, 3 door, 2 staircase double deck stole the show at the LTA-UITP Singapore International Transport Congress and Exhibition (SITCE) in Suntec City, Singapore during October 2016. The concept bus retains many of the features which have made ADL’s Enviro500 the most popular high-capacity double deck bus in the world. The most significant difference is the third door and second staircase. The second and third doors act as the exit points for all riders, the result being an efficient, two-stream passenger flow throughout the vehicle which speeds up boarding and alighting, reduces vehicle dwell time at bus stops and enhances the passenger experience. Ease of access for all passengers is guaranteed thanks to the absence of any internal steps in the lower saloon. 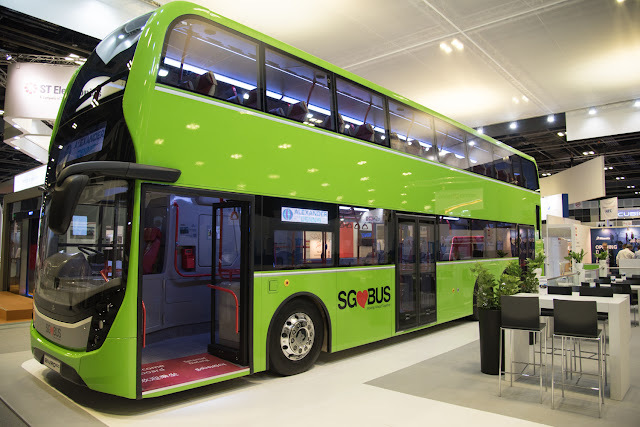 The bus has a range of sophisticated on board specifications including luxurious high back contoured seating, WiFi, USB charging points at all seats, mood lighting and passenger information screens. Improvements for the driver include a comfortable, ergonomically designed seat within the spacious cab area. A large curved windscreen offers excellent visibility, and a CCTV monitor gives the driver all round clear views of staircases and exit doors for the added security of passengers. Paul Davies added, “Our collaboration with the LTA to develop this concept bus underlines our commitment to this critically important market. With over 200 Enviro500 vehicles in circulation here, we already have a strong foundation in Singapore. In summer 2015, we invested in a new, centrally based, local HQ in Tagore 8, which is headed up by Bill Thong. We are delighted Bill joined us, bringing over 15 years senior management experience in commercially focused roles having been with Michelin, Alcoa, Akzo Nobel and Comfort Delgro, before joining Alexander Dennis Limited.